Kimi Räikkönen who has once again changed revolutionary his hairstyle, will next season be the oldest driver in the F1-serie. 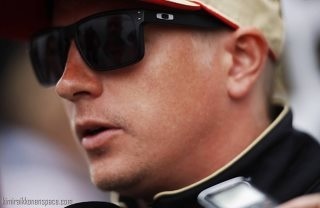 – It doesn’t sound good at all, Räikkönen snapped when hearing it on Thursday. His cap was deep down in his head. The hair, which was long at the middle of the head, was concealed but the long mullet was clearly visible. Räikkönen is like tailor-made as Webber’s replacement, although many things have to be cleared before a dream switch like this – from a Finnish POV – can happen. – It’s not a a secret that I have ongoing negotiations, but I don’t have a contract anywhere next season. It’s normal that people speculate with different options. I have 2-3 options plus the possibility of not driving in F1 and doing something else, Räikkönen tells. – No matter what my decision will be it won’t be easy to make it. This isn’t the first time when I have different options on the table. – I want to do what’s best for myself. It would be ten times easier if the regulations, engines and cars would be the same next season, but when everything is changing one has to decide depending on which package feels the best, Räikkönen told. – No matter what my decision will be I only know in the long run if it was right or wrong. Then I just have to live with it. In Lotus Räikkönen’s PR-days can be counted with two hands. In Red Bull there would be more for certain. How decisive is the PR-freedom for you in contract negotiations? – It’s one of the key factors. I always want the best car and Red Bull has proved they have the best package for the last four years. There can’t be anyone stronger at this moment. Out of F1-drivers Sebastian Vettel has the most closest relationship with Räikkönen. As a matter of fact the German has said that he wants to possess certain qualities that the cool Räikkönen has. – I have never had difficulties driving with anyone. I have never been in the position where I can decide who my teammate is. If it would happen that I would drive with Sebastian in Red Bull, then it would probably be more easier than with anyone else,” Raikkonen thinks. It’s a translation from Finnish by another person, I didn’t have time to re-edit it as I was on my way to work. You get the idea – that’s what counts. I think Kimi’s latest haircut is perfectly logical. The history of the Mohawk hairstyle shows that the Cossacks of the Ukraine in the 16th century and the soldiers of the 101st Airborne Division in World War II would shave the sides of their heads in order to appear more intimidating to the enemy. The Pawnees were another Native American tribe that warriors often wore their hair in this fashion. Makes perfect sense then for the new haircut.